A couple of days ago, Anna Pollock, who is currently engaged in a deep inquiry into what ‘regenerative tourism’ might look like, sent Michelle Holliday, Giles Hutchins and me a message alerting us to a recent ‘trend report’ on regeneration by a major marketing and communications firm. The speed at which the regeneration meme is spreading into all aspects of society and infiltrating the mainstream is breathtaking and faster than I would have anticipated when I told my colleagues in Gaia Education in early 2014 to take a closer look at Bill Reed’s article from 2007 ‘Shifting from sustainability to regeneration’. While we were still using the word sustainability our programmes were actually offering an introduction to a regenerative whole systems design approach to sustainability. Now that the marketing, communications and advertising industry have connected to the ‘regeneration’ meme, we can officially say that the awareness of regeneration is reaching the mainstream. Yet we are still at the beginning of our exploration of what regenerative practice will look like in all walks of life. We are living into the questions that might help us co-create diverse regenerative cultures as elegant expressions of the biocultural uniqueness and inherent potential of the places they inhabit. We are standing at the dawn of the Century of Regeneration. Among the early regeneration pioneers were people like Bucky Fuller, John Todd and the New Alchemists, J.T. Lyle and Charles Krone. By the time ‘Designing Regenerative Cultures’ was published in May 2016, the deep practice of working regeneratively had already been developed — and to a not insignificant degree also been rediscovered through paying renewed attention to indigenous ways of inhabiting place over time. Darren Doherty and friends had established the Regrarians Platform. Ben Haggard, Pamela Mang, Bill Reed and the Regenesis Group had build a long track record in the field of regenerative development and design. Carol Sanford’s work influenced many early practitioners. In 2016 she was building the foundations of the Regenerative Business Summit and finishing her book on the subject. John Fullerton had recently published his white paper exploring what a regenerative economy might look like. Both Fullerton’s white paper and Daniel Pinchbeck’s ‘Towards a regenerative Society: A Rapid Transition Plan’ were published while I was finishing my book and confirmed to me that regeneration was emerging as humanity’s transformative response to the converging ecological, economic, and social crises we are facing. Just like the Rodale Institute’s report on ‘Regenerative Organic Agriculture and Climate Change’ and Ethan Roland and Gregory Landua’s ‘Regenerative Enterprises: Optimizing for Multi-Capital Abundance’ had done before them. As early as 2006 — on the back of my PhD research — I had published work on the need to go beyond sustainability and to create a health-generating (salutogenic) design approach that would improve human and planetary health. If you want to find out more, I recently offered an hour-long ‘Glocalizer’ webinar on ‘Designing for Regeneration and Planetary Health’ through my work with Gaia Education. After some 30 years of pioneering the approach by folks mentioned above, the regeneration meme is finally taking off on a very steep adoption curve in business, international and bioregional development work, tourism, education, leadership trainings, investment and finance, and many industry sectors. In short, there is a lot happening in all-things-regenerative. Many people offering advice on regenerative business, leadership, investment — some of them with more depth than others. The cosmetics company Lush has launched the Spring Prize in 2017, annually offering 11 prizes in 4 categories for projects that implement social and ecological regeneration. The 2019 application deadline is November, 9th, 2018!. Regeneration International is mapping regenerative agriculture projects around the world and aiming to support the transition towards regenerative land management practices and a regenerative food system. I recently mapped many more organizations and people active in the current confluence between regenerative development, ecosystems regeneration and the promotion of planetary health (see below). Building a movement needs ‘band wagons’. As more folks jump on, there is initially a loss in depth of meaning of a framework as people begin to use the language while they are still in the process of developing a better understanding of the deeper significance of associate practice. At that stage the guiding ideas are gaining breadth-of-reach while trading off depth-of-meaning, significance and practice. J. Walter Thompson Intelligence is offering services in research, innovation and data analytics. The company is part of the the J. Walter Thompson Group that describes itself as “the world’s best known marketing and communications brand”. The publication of their ‘The New Sustainability: Regeneration’ Trend Report is likely to mark another step change in what I have called ‘ReGeneration rising! and the ‘Regenerative [R]evolution’. Marc Barasch recently positioned the meme in an interview with Forbes on ‘How a regenerative revolution could reverse climate change.’ Could these be memetic ripples from the ‘Regenerative Development to Reverse Climate Change’ event held at the Commonwealth Secretariat in 2016? A meme travels rapidly into the cultural mainstream, once a massive and influential marketing agency such as J. Walter Thompson picks up a trend and highlights it to its global client base who then turn it into the slogans and languaging to influence the way they are perceived and rated by customers. This process in itself becomes culturally creative — for better or worse. The question will be to what extent slogans are followed — or better preceded — by transformative innovation and action. Now is the time to invite deeper conversations and deeper questioning into what regenerative practice entails. We have to engage those in business, public sector and civil society who are becoming curious about ‘regeneration’, how it might differ from ‘sustainability’, and what regenerative development, business and cultures might have to offer as transformative responses to the converging crises — and opportunities — we are faced with glocally (not a typo!). There is a danger of people beginning to think of regenerative practice as a simple rebranding of sustainability, yet there is also an opportunity to spread regenerative practice more widely and deepen the conversation through living the questions together. Rather than complaining about ‘regeneration’ undergoing a watering-down or bastardizing-of-meaning that ‘sustainability’ has been subjected to for years, let’s turn into the skid and make the most of the growing band wagon of ‘regeneration’. I believe the meme ‘regeneration’ is a lot more robust than ‘sustainability’ as it carries the core message that life is a regenerative community — or as biomimicry elder Janine Benyus puts it ‘life creates conditions conducive to life’ — in its primary semantic. The J. Walter Thompson trend report walks a fine line between a simple rebranding of sustainability and highlighting a number of aspects how working regeneratively is different from what most business would include in their sustainability strategy. The 109-pages report manages to address some of these differences and fails to even mention important others — falling particularly short on the change of cultural narrative and transformation of consciousness and personal development that are all such critical aspects of the rise of the regeneration. In the seed of the ‘regeneration’ meme lies the potential for the redesign of the human impact on Earth. Regenerative development and practice offers the creative promise for all of us to collaborate in co-creating a world that works for all. The urgency of NOW — the current converging crises — is leaving us one option (all other mean extinction in the short to mid-term): to heal the Earth and her people together as one humanity taking a maturation step in the evolution of our species, celebrating all our diversity as expressions of life’s abundance and a wellspring of our collective creativity and resilience. The recent report is offering interesting results of surveys into consumer preference and attitudes conducted by J.W. Thompson in the US, UK, Australia and China. It seems that the public attitude towards sustainable consumption and life styles is changing rapidly and that conditions are set for a massive rise in regenerative development, innovation and the redesign of the human impact on Earth. Let’s hope so! Let’s do our best to take this opportunity for rapid cultural transformation. 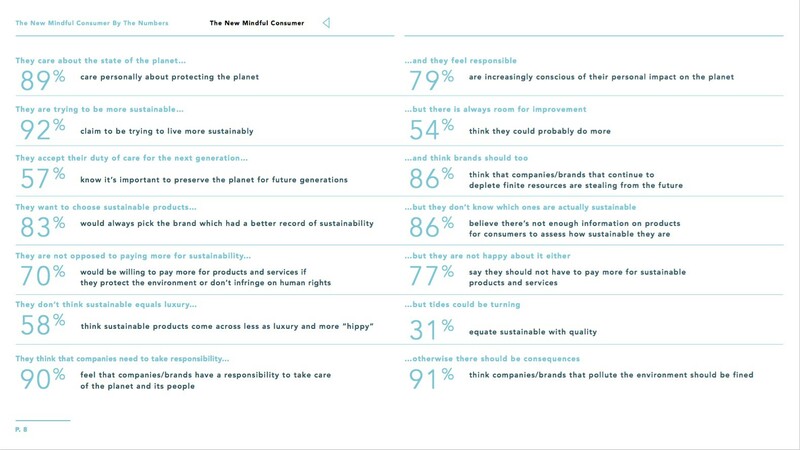 The table below — taken from the report — describes the attitudes of ‘the new mindful consumer’. Yes, I don’t like the word ‘consumer’ either and clearly there is still room for improvement as we become new mindful co-creators in the redesign of the human impact on life. I will go into some more detail on the content of the J. Walter Thompson report in a subsequent post. I would encourage you to take the time to read the report as it is full of interesting examples of companies and innovators trying to make a real difference. It also reviews a number of fascinating trends in consumer attitude (obviously biased by the sample size, countries and demographic groups that were surveyed). This set of ‘principles of good business’ that the report offers is not a bad place to start a conversation about transforming existing businesses into regenerative business. Not everyone finds the language, principles, and frameworks offered by Carol Sanford for regenerative business practice or by Regenesis Group for regenerative practitioners as accessible. They are the ‘advanced course’ that will take you into a much deeper understanding and practice of regeneration. If I learned one thing from my study of ‘spiral dynamics’ and ‘integral theory’ it is that we can be more effective in leveraging transformative change if we “talk to people in language that reflects where they are at and not where we want them to be”. I believe that this is what the trend report of regeneration is doing. It is compromising depth-of-meaning for breadth-of-reach. How can I more effectively serve the emergence of diverse regenerative cultures where I live and everywhere? How can I contribute to the healing of the Earth and her people, place by place, bioregion by bioregion? How can I play my part in the redesign of the human presence on Earth from its current degenerative impact to one of social, ecological and economic regeneration? The report seems to suggest that our numbers are growing. Let’s celebrate that and renew our commitment to deepening our practice! You can download the report by J. Walter Thompson Intelligence on ‘The New Sustainability: Regeneration’ here. Here is a link to a one hour conversation on ‘Regenerative Business’ that Jenny Andersson (We Activate the Future) recently hosted on Connectle with Ralph Thurm (Reporting 3.0), Zoe Le Grand (Forum for the Future), Jon Khoo (Interface) and me. Enjoy!